This uplifting stick incense fills your space with the fragrant notes of two night-blooming flowers known for their sweet floral, and carnal yet velvety nuances-jasmine and tuberose. Find pleasure in the citrusy and elegant light note of bergamot oil, with its fruity-sweet and mildly spicy note that men and women find equally alluring, with the subtle scents of peach and strawberry in the background. Bergamot is also a popular scent in aroma therapy used to treat depression. Hints of musk and vanilla complete this exotic fragrance, wrapping like an exotic vine through this rich floral fragrance. 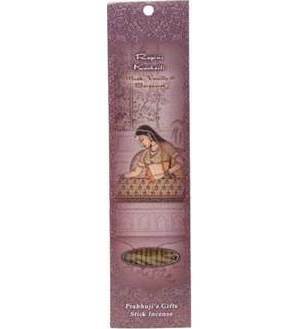 This fine incense is named after Ragini Kachaili. A ragini is a female raga, an ancient melodic form of Indian classical music played in a certain scale of notes with its own melodic form and associated mood. Let the distinct atmosphere of this exotic and uplifting ragini fill your space, touch your spirit and inspire your mind. The raga-ragini combination evolved from the spiritual practice of Tantra around the 14th century. Together the static and dynamic energies create mood-evoking music.